Nano-magnetic cell targeting used to treat TBI in animal model. Cellular therapy for traumatic brain injury (TBI) has been suggested to replace cellular loss, restore growth factors homeostasis, repair damaged circuits and improve functional recovery. Stem cell therapy for TBI has been given by intracerebral injection, intravenous injection, lumbar puncture, and intra-carotid injection. The efficacy of each of these techniques has not been addressed thoroughly. Treating TBI using stem cell therapy is an important area of current research. However, injecting stem cells into the central nervous system has serious drawbacks, including intracranial hemorrhage and cells failing to reach TBI-affected areas of the brain. Now, researchers from the University of Maryland and the Veterans Administration Maryland Healthcare System state they have successfully guided human neural progenitor cells (hNPCs) to injured brain areas using nano-magnetic cell targeting. The opensource study is published in the journal Cell Transplantation. Previous studies show that magnetic cell targeting is ideally suited to augmenting cell therapies. The external magnetic field and field gradient can guide cells to sites of injury and, using MRI, the iron-oxide superparamagnetic nanoparticles can be visualized as they travel to the site of injury. The goal when employing this method is to guide the particles to the site of injury and enhance entry into the brain to enable the subsequent retention of transplanted cells. The current study labelled hNPCs with iron-oxide superparamagnetic nanoparticles and guided them to the site of injury using a magnetic field in a rat model of TBI. The nano-magnetic was administered via intra-carotid delivery. Visualization of transplanted stem cells by magnetic resonance imaging (MRI) was also achieved using stem cells labelled with these types of particle. Animals were fitted with a temporary magnetic hat to enable magnetic retention of transplanted stem cells. Results show a significant increase in delivery efficiency and retention of iron-labelled hNPCs at damaged sites, this was confirmed with MRI. Data findings show that the magnetic field delivery method does not affect the viability of hNPCs and that the method provides both increased homing to the injury site as well as retention of the transplanted cells. However, the group stress that further study is needed to observe the transplanted stem cells when the magnetic field is no longer present and to standardise dosage of magnetic intensity in relation to transplant quality. They go on to add that the minimum length of time the magnetic hat must be in place for successful cell transplantation should also be investigated. The team surmise that their findings show that magnetic retention of iron-labelled hNPCs is a promising technique for cell delivery in TBI and neurodegenerative diseases, with potential for clinical translation. They go on to add that the significance of this study lies in the fact the method used circumvented the need for invasive transplantation procedures, such as intracerebroventricular injection. For the future, the researchers are currently assessing long-term changes in hNPC viability and differentiation following magnetic retention, and also investigating the transplant method’s enhancement of functional recovery following TBI with view to human trials. 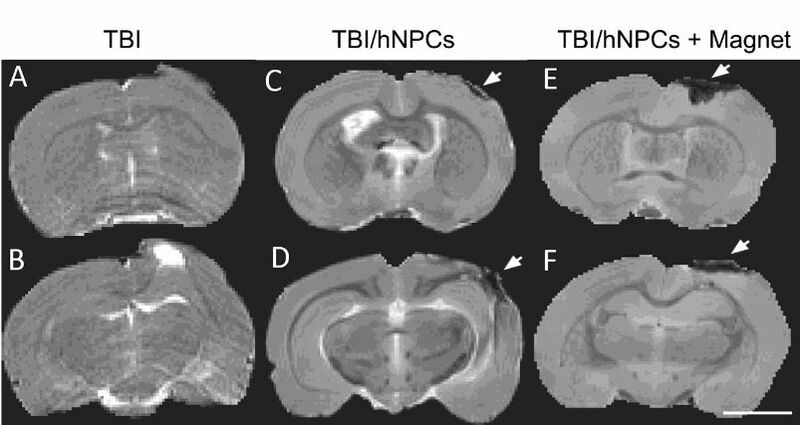 T2WI of TBI rats 2h after CCI and before MIRB-hNPC transplantation; animals were not wearing a magnetic hat. The region of increased signal contrast in (B) is due to edema. (C-D) Ex vivo T2WI 5d after MIRB-hNPC transplantation in TBI-controls not wearing a magnetic hat. A small decrease in signal contrast was seen at the site of injury. (E-F) Ex vivo T2WI in TBI-rats wearing a magnetic hat. An extensive decrease in signal contrast was found. The location of the loss of signal contrast was confirmed by Perls’ Prussian blue staining and with immunocytochemistry of MIRB-hNPCs with human specific SC121 antibody. Cell-based therapy in TBI: Magnetic retention of neural stem cells in vivo. Yarowsky et al 2015.